I will be saying this till I'm blue in the face - linguistics is a great tool to impact marketing, branding and segmentation. What you say - more specifically how you say it, describes a lot about your own personality. This article I found suggests that just by capturing 50 tweets companies can analyze and predict what products or services you are more likely to buy. But how? Let me describe a little bit of the science behind tweet psychology. "The quick foxed jumped over the mean lazy brown dog." Ok. Now, you ready? This is going to be very, very, very hard. Pay attention. Please keep reading this sentence a bit, maybe this word "Pneumonoultramicroscopicsilicovolcanoconiosis" - I just need you to get further down this paragraph so you can't see the first sentence. GOOD - Don't look up! Now, how many non-verb/subject/adv/adj words were in the sentence about the fox from above. If you said 3, you're a super-freak - No, JK, you are normal however the point of this exercise is to demonstrate the transient nature of pronouns (and all other words that aren't verbs, adjs, advs or nouns for that matter). Your brain is programmed to strip away this non-essential information like meat from a bone. Pronouns and all of these filler words (because, that, we, up, therefore, she, besides, however) are parsed out of normal conversation and forgotten. Your brain remembers the: Who, What, Where, When and Why - the meat. You'll notice that Bud Abbot has a hard time using anything but "filler words" (pronouns, prepositions) while Lou Costello can't seem to find one single filler word - he only uses proper names and verbs. This is because Bud Abbot has received damage to the Nouns/Verbs/Adj/etc processing center of his brain while Lou Costello has received damage to his filler "social words" processing center. So, now we agree that filler words, compared to nouns and verbs, are contained in different boxes in the mind? Would it surprise you to hear that pronouns and fillers are kept in the very front, youngest part of the brain - the "social" box? (which makes sense as they are social referents). Nope? Moving right along, how you use these social referents tells us a lot about how you live in a social world. For example, do you use the "I" pronoun more than the "we" pronoun? 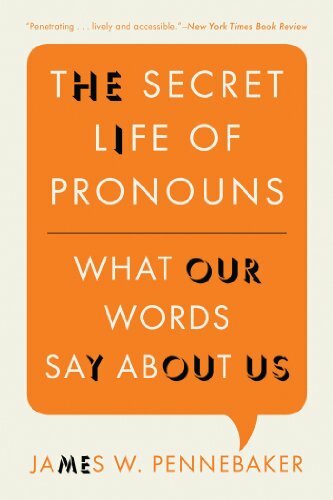 DID YOU KNOW - men use the pronoun "I" slightly more often then women, while women use the pronouns "You /He/She" slightly more often than men. So users that tweet "s/he" more often and use causal words (because, cause, on account of) are more likely to be rational, logical, social thinkers - who would obviously gravitate to a certain kind of product or experience. Now the game is over. BAM, once the company has you profiled they can market to you more effectively. YES! This article talks about the use of storytelling and narrative to persuade and convince people. This is exactly what I am talking about - and I therefore completely agree. The egyptians mastered this technique - capturing our imaginations with myths and stories of the devine. The story of Osiris - A 3,000BC social media tactic? What's even MORE surprising - the structure they lay out in the slideshare article has remained relatively unchanged. You don't have to follow this structure (but it would be fun to try to fit this character arch into - say - GE's brand story - very entertaining indeed), however the classics have always worked and will always work for a good reason!